Equities Lab offers you an exceptionally strong stock screener. You can find exactly the stocks you want, as our screener works across time, and in great detail. Can you screen for companies manipuling earnings via accruals? Yes, it can! Can you screen for companies that have never made money? Yes you can! You will also see what your screen returns, and this will help you understand why. We debunk myths as part of what we do. 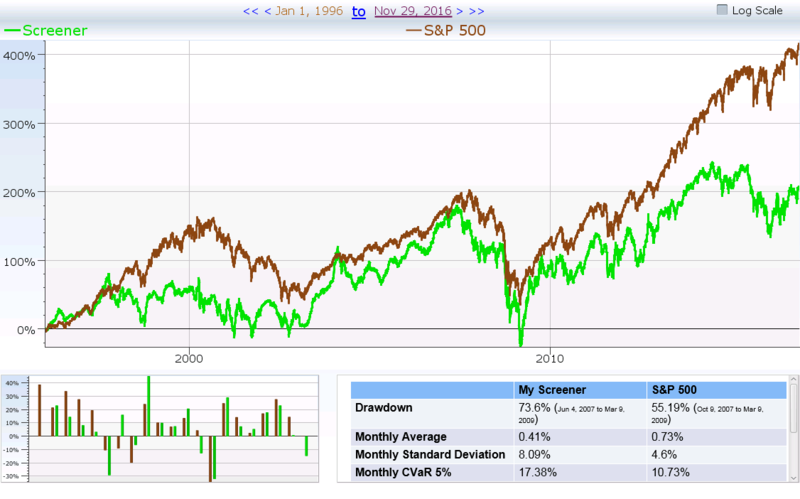 Believe that buying high P/E stocks generally works better? We’ve got a stock screener screen for that. This screen had its moments, but it spent a lot of time underperforming. How about buying at (or near) the 52 week low? Another fine myth busted before it could hurt your portfolio. The next time someone (you, probably) has a great idea, your fingers will be itching to test it. That testing will ensure that you succeed, and enjoy the process. Don’t start from scratch every time. We give you a rich set of pre-defined screens. That may be as far as you need to go. These screens, although intricate, are really easy to read and understand. They use fundamental and technical analysis to choose their stocks, and they just wait for you to modify them and make them yours. If you have ever done any computer programming, you will soon see that this carefully crafted language is easy and a delight to use. We prompt you with choices as you type, and we have help on all of our fields. Our formulas have many of the basics included, so you can build bigger ideas with less work. We can compare, select and perform mathematical functions. So can others. But we also have ranking, sorting, and counting operations. These make the difference between asking “Is the P/E below 10?” and asking “Is the P/E lower than 75% of the others in its industry?”. Counting allows you to require some, but not all of a set of conditions be true. Why would you do this? For the same reason you search for employees that match most, but not all of your qualifications. You will want to check how quantities change over time. This allows you do ask questions like “Is the P/E always low, or is it normally higher?” or “Is the P/E low because earnings rose?”. You will be able to test and select for rates of change of any accounting information across time. Advanced users find built-in features to calculate standard deviations, skewness, variance, correlation, kurtosis and even Monte Carlo search logic. 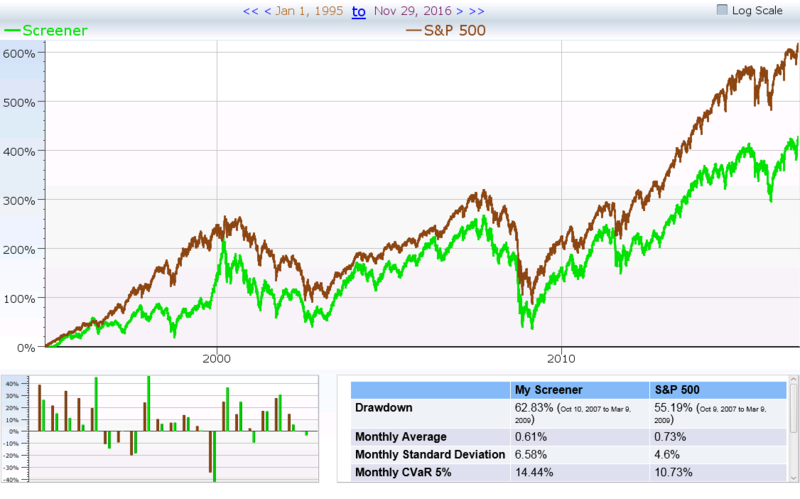 This transforms technical analysis from “Find stocks that went up” to “Find stocks that have less volatility than their peers, and went up smoothly over the last year, excluding the most recent month”. If your screen returns 12 results, getting them in a list is OK. You can manually check to see if they concentrate in an industry, or are all small cap stocks. You will want some help if your screen returns 112 items, or 1,112 items. You’ll also want bar charts of performance, scatter charts, and more. We give you that. You can also search to see if a given stock is in your basket, or how many tech stocks you got. Seeing performance is all well and good, but the ability to “jump around” in time is helpful. See what you would have seen right before the crash of 2008. Examine the recovery in March 2009, and see if you could have predicted it. Go to January of 2011, and see if you can figure out a strategy that makes money during that difficult year. Those who are ignorant of history are destined to repeat it. We help you fix that ignorance. We know there’s a lot here. 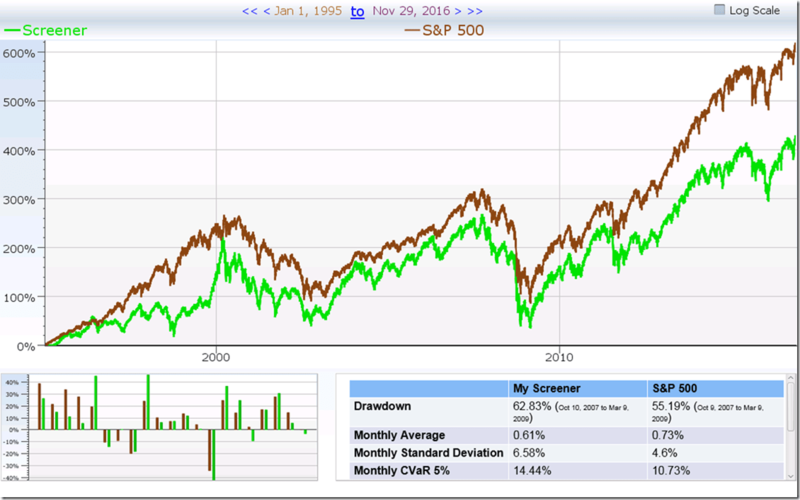 You can compare stocks against groups of other stocks, against itself through time, or against various criteria you set up. You can use standard deviation, averaging, maximum, minimum, and more. You have a world of possiblities here. You can jump through time, and see everything change, and get wiser about history. And, you can dig deeper into the financials, with more detailed metrics than you are probably used to. We at Equities Lab has created samples of many “chunks of code” that you can quickly draw upon and include in your screener by name or by copying and pasting what you want. If you get stuck, we can help. Just email support@equitieslab.com. This is serious business. We know. That said, it is liberating (and downright fun) to be able to play and explore with ideas that you have been limited to reading about up to now. Equities Lab gives you this power.